Combine yeast and 1/2 cup water in a glass measuring cup; let stand 5 minutes. Combine yeast mixture, milk, and next 3 ingredients in a large mixing bowl. Add flour, stirring until smooth. Cover and chill 8 hours.Whisk in eggs and baking soda. Prepare in a waffle iron according to manufacturers directions. 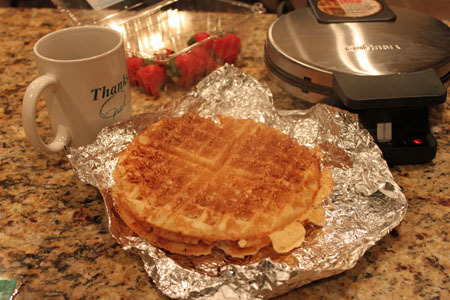 I used my little Cuisinart and made each waffle with approximately 1/3 cup of batter. It’s thin, so if you’re using a small waffle iron, pour it on slowly. Makes about 12 waffles (but varies, depending on size of waffle maker).